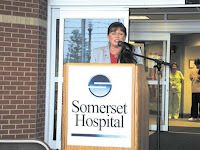 “We were ready Sept. 11 and then it took the wind out of our sails,” said Somerset Hospital’s director of corporate communications, Greg Chiappelli. He was talking about hospital employees who were ready to offer medical help on Sept. 11, 2001, but in the end, weren’t needed. He mentioned this commemoration to employees prior to a Sept. 11, 2001, memorial service Tuesday, which was sponsored by the Pastoral Care Committee at Somerset Hospital. Hospital employees, as well as the public, were invited to the service. The Rev. Ruth Ann Campagna and the Rev. Mark Bendes offered prayers and scripture. Danny Conner performed two musical selections. Valencia McClatchey was the featured speaker. She took the photo “The End of Serenity” of the smoke from the Flight 93 plane crash in the field near her home. McClatchey said she heard a tremendously loud noise, unlike anything she’s heard in her years of living near coal mines, and looked outside of her house to see a flash like sunlight reflecting off a plane. She said she always has a camera by the door because she has a friend who is a helicopter pilot and does training runs around the Indian Lake area. She said her friend will fly by her house, and she wanted to be ready to get a photo of him flying over for a car club newsletter. Then she saw the mushroom cloud. She took the photo that has made the news all over the world. She said she called the photo, which now hangs in the Smithsonian Institute, “The End of Serenity” because it was the end of our peaceful lives as we knew them to be. She said we are slowly getting back to that, but that we’ll never forget Sept. 11, 2001. Valencia McClatchey, the woman who took the photo “The End of Serenity” on Sept. 11, 2001, of the mushroom cloud after United Flight 93 crashed near Shanksville, was the guest speaker at Somerset Hospital’s memorial service Tuesday.